Volga is a car brand that was developed in the URSS in order to replace the beloved GAZ Pobeda in 1956. This car outlived several generations, but... Will it survive this bloodthirsty zombie invasion? Run over the creatures you find in your way and get rid of them before they take over the population! Oh, no! Something terrible is happening! 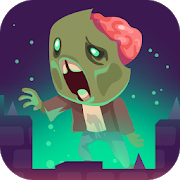 Waves of dangerous zombies are running free, wreaking havoc in town and eating people alive. This cannot be allowed! Get in your car and run over as many creatures as you can.